Fixed Guide awnings are ideal where space is at a premium and close fitting is required. Available in fixed and adjustable aluminium Louvres in a number of powder coated colours. A sleek alternative to the side channel style awnings, where channels can intrude on a view. Designed to be fitted off an existing wall or roof and without unsightly supporting posts. Ideal for verandahs and windows, spring operated and has no cords, cleats or guide systems. We can supply and install clear or tinted PVC café and bistro awnings to suit your needs. Consisting of sprung arms and a roller, the arms can pivot in an arc almost 180 degrees. Heavy duty side channel awnings are suited to wide areas and areas where wind is an issue. We supply & install manual or motorised ZipTrak awnings in a range of colours & materials. Kawana Blinds manufactures and installs a large range of awnings, this allows us to design an awning solution that will look great and be most effective for your home or business. 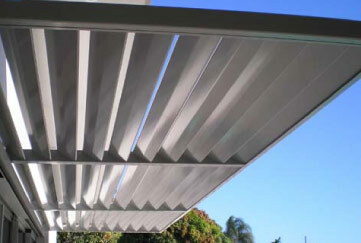 Our awnings are built with quality components and workmanship, ensuring a strong durable product. Want a FREE Awning Measure & Quote? Simply call or email the Kawana Blinds team and we’ll come discuss awning options that best suit your needs.